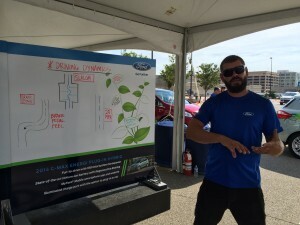 Last month, we got a chance to check out the Ford EcoBoost Challenge on the last stop of their tour. Designed to give consumers an unbiased look at how Ford’s offerings stack up against their closest competitors, the challenge gave us some real insight into Ford’s plans for their hybrids, their performance line, and their EcoBoost technology. 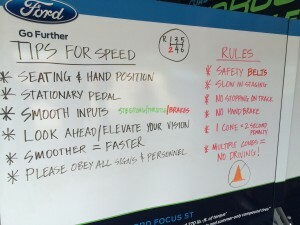 After a small breakfast and a welcome from Ford’s team, we headed straight for the Hybrid portion of the challenge. At the head of the queue, there was a staging area where an expert gave us a rundown of the two vehicles we’d be driving, the Prius and the lesser-known Ford C-MAX Hybrid. We talked a bit about the hybrid technology in both cars, and then we got a breakdown of how the course would force us to accelerate and brake at key points to test the switch from electric to gas, and then to get a feel for how the brakes charge the electric engine. Out on the course, we took the Prius out first. It accelerated nicely, but there was a slight jump once we got over 25 miles per hour and made the jump to gas. The C-MAX was much smoother in that regard, but we were most impressed by the interior. 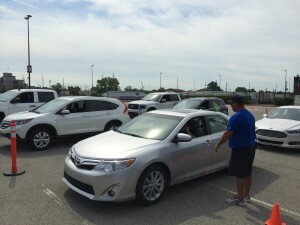 It was comfortable with plenty of headroom, and the technology was impressive. In a market where the Prius is synonymous with hybrid, it was pretty clear to see that the C-MAX is a real competitor. 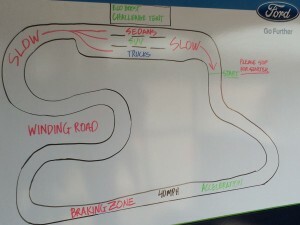 A whole half of the challenge area was dedicated to the Ford ST Performance Academy, where drivers were encouraged to take out performance-class Ford Fusions on a tight course. There was even a leaderboard that allowed drivers to compete for the best time locally and throughout the challenge’s recent history. For our money, though, the best part of this experience was hopping into the passenger’s seat for a ride with a professional in a souped-up Ford Focus. The driver narrated an exhilarating course filled with tight turns and screeching tires. 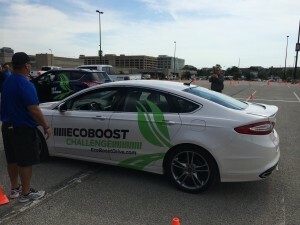 We ended the day queued up in the most comprehensive line at the EcoBoost Challenge. On a single track, Ford had matched up the Fusion with the Toyota Camry, the Escape with the Honda CRV, and the F-150 with the Chevy Silverado. More than the ST track which was designed to test the limits of the cars, or the Hybrid Challenge, which was there to give you a sense of the transition from electric to gas, the main EcoBoost Challenge course seemed to reflect the sorts of challenges drivers face on real roads every day. Just as with the previous two courses, we were treated to a breakdown of the vehicles’ vital stats as well as a diagram of the course. The trucks both handled the course well, although the F-150 was the only one we were able to get above 40 MPH in the limited acceleration zone. The clear standout here to me was the Escape, whose handling and smooth acceleration blew the Honda CRV out of the water. But, as they say, this was Ford’s home turf. The courses were carefully designed, probably to Ford’s advantage, but it’s hard to argue with the perspective you get from test-driving eight different vehicles side-by-side. 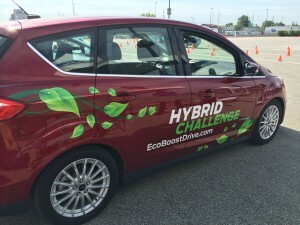 Ford’s is a team that understands how to market their vehicles to smart consumers. Cut the taglines, the promises of power and mileage, and give drivers the chance to get behind the wheel to see for themselves. If you ever get a chance, be sure to check this challenge out. It might change your mind on more than a few things, but above all else, it’s a whole ton of fun.